Fred Weasley is a character of the Harry Potter theme, and is the older brother of Ron and Ginny Weasley, and the twin brother of George Weasley. His parents are Arthur and Molly Weasley. His only physical appearance is in the 2011 set 10217 Diagon Alley. 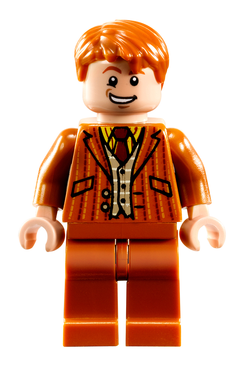 Fred Weasley has scruffy light orange hair that has also appeared on Jay, Arthur Weasley, and George Weasley. His head is light nougat and features large grins on both sides. One showing teeth and the other not. The grin is substantially large on both sides causing one eye to squint. His dark orange torso is a coat of the same color with brown and yellow patterns. Underneath are a vest with white patterns, a yellow shirt with dark red stripes, and a dark red tie with a yellow line to make the tie shine. Accompanied with the dark orange arms are light nougat hands. His dark orange legs feature no printing. Fred is one of the members of the Weasley family. Along with his twin brother George Weasley, he is the family jokester. He and George were both Beaters on the Gryffindor Quidditch Team. In Harry's fifth year, he and his brother joined Dumbledore's Army, and then the duo left school to start their joke shop, Weasley's Wizarding Wheezes. Fred eventually dies during the Battle of Hogwarts in Harry Potter and the Deathly Hallows, but George Weasley and his wife, Angelina Johnson, had a child named Fred Weasley II in his honour. Being identical twins, Fred and his brother George are the exact same minifigure. Fred (left) as he appears in the game. Fred (left) as he pulls Harry into the passage.